There's a lot going on in our lives right now. Lily had two cavities filled yesterday morning, and Timmy and Zach were home sick with sore throats and general malaise. I decided to take them in to the doctor to get their throats swabbed since I've heard of strep going around. After receiving our "negative" result for strep, the two boys, Lily and I headed across the street to Culvers for lunch. While we were waiting for a very slow three year old in full princess attire to finish her icecream, we suddenly noticed that Timmy was missing! Lily guessed the bathroom; Zach calmly suggested he'd been kidnapped while refilling his pop... After waiting for him to return for a couple of minutes, I was starting to get that "disturbed mother" feeling. I stood up and did "the scan," which has lost some of it's effectiveness since I got lasiks and can't see as well as I did with my glasses. I was on my second scan of the restaurant and contemplating raising the alarm when I saw him! He was sitting in the sunny south bay window of the restaurant, by himself, half undressed and splayed out across a chair soaking in the rays after a satisfying lunch. --Completely oblivious to everything else! We laughed and just let him be. 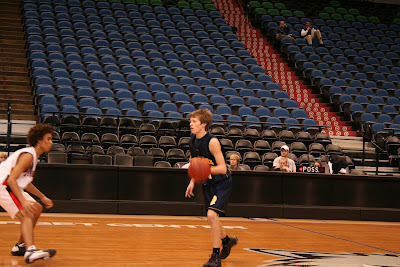 This is during the B game (10th grade team). 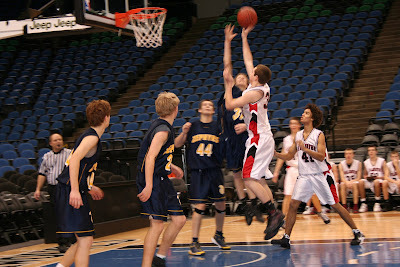 Andrew is the one going for the block. 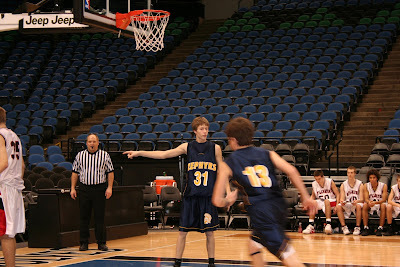 Bringing it down the court....I love watching him do this, especially when pressed. 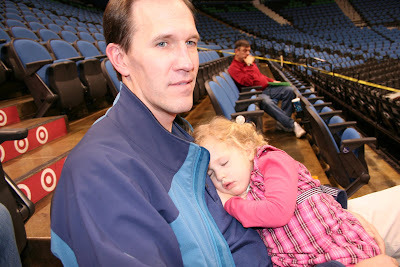 This was Lily during the JV game, which Andrew got to play about 5 minutes in. Tim, Lily and I left after two games...but left Timmy and Zach in the stands with friends to watch varsity play. Apparantly after we left there was a huge altercation with parents from both teams, and the security guard was threatened and people kicked out! I'm glad I wasn't there because I HATE that stuff...but I'll admit, it's rather entertaining to hear Timmy give the play by play. He's everywhere! Oh, the life of a child: ice cream in full princess regalia, time to splay out in front of a sunny window, napping on someone big and warm's chest . . . sigh. Such a contrast to worries about college tuition, billion-dollar-bailouts, small business profit margins, and deadlines, deadlines, deadlines! I love the Picture of Tim and Lily! !